The most frequently requested Christ in Prophecy television show episodes on Revelation have been pulled from the vault and re-released! 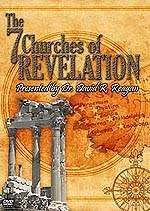 Over the six episodes, Dr. David Reagan and guests Don McGee of Crown and Sickle Ministries and Dennis Pollock of Spirit of Grace Ministries go chapter by chapter through the book of Revelation, explaining that the book of Revelation isn't difficult to understand, rather it is difficult to believe. But, if you will believe it for its plain sense meaning, you will understand it. For anyone who's been born again and has the Holy Spirit residing within them, Revelation can become very clear. We'll continue on in our journey through the great book of Revelation in Chapters 2-3. Feel free to watch, listen, or read along by clicking one of the icons below. Dr. Reagan: As we move to chapters two and three, the focus shifts from Jesus the Glorified One to Jesus the Overcomer, who is encouraging His Church to persevere and overcome with Him. Chapters two and three present us with seven letters written by Jesus to seven churches. These are very interesting letters because first of all they are letters to seven real churches located in the area we know today as Turkey. But these churches were selected for a reason, and that's because they are representative of all churches existing at that time and today. I also believe these seven churches are also representative of seven periods of church history. All seven types of churches have always existed and exist today, but one type has dominated each period of Church history. Let's just look at the types of churches that are represented in the seven letters. The first church addressed is Ephesus, which was a legalistic church. It was a church that dotted the I's and crossed the T's, but it had lost its love. The church at Ephesus is representative of the apostolic period from 30 A.D. to 95 A.D. when the church was concerned about organization and doctrine to the point that it became legalistic. In verse eight we are introduced to the church of Smyrna. The church at Smyrna represents the persecuted church, or the martyr church that existed from 95 A.D. to about 312. It's the church that existed at the time that the book of Revelation was written. In verse 12 we have the church of Pergamum, which is the liberal church. It's the church that doesn't care anything about doctrine — it's the opposite of Ephesus, it embraces everyone. This apostate church existed from 312 A.D. to 590. This period developed after the emperor Constantine was converted and the church and the state were welded together. As is always the case in such unions, the state began to corrupt the church. Then, in verse 18 we have the church of Thyatira, which is the pagan church, the church that is full of cultic practices. The church at Thyatira represents the dark pagan period from 590 A.D. to 1517 when the Papacy developed and the church became full of Babylonian occultic practices. Dr. Reagan: Chapter three begins with the church of Sardis, which is representative of dead churches. It has a reputation of being alive, but in reality it is dead. When we come to the reformation in 1517 we think of it as a time of life, but you know it was really only partially so. The Reformation produced the Protestant state churches of Europe, churches that had a reputation for being alive but were really dead because of their union with the state. So the church of Sardis, the dead church, with a reputation for being alive represents the post reformation period from 1517 to about 1750. The next church mentioned — the church of Philadelphia — is the church that we would all like to be a member of because it is the alive church, for which Jesus has no criticism whatsoever. The opposite of Sardis is the church at Philadelphia. It represents the period of church history from about 1750 when the church began to send missionaries out all over the world, until about 1925 when the German school of higher criticism invaded seminaries worldwide and destroyed many people's faith in the Word of God. And then, finally we have in verse 14, the church of Laodicea. In many respects it is the most pathetic of all the churches because it's the worldly and apathetic church, the church that is "neither hot, nor cold" because it could simply care less. The church of today is represented by the church of Laodicea, a church that says to the world, "I am rich, I have become wealthy and have need of nothing." But Jesus says to that church, "You are wretched and miserable, and poor and blind and naked." It is a worldly, apathetic, apostate church that will not even let Jesus in the front door. Now, as I said, these seven churches are representative of every kind of church that exists today. You will find your church in one of these seven, or in a combination of them. I also think they are also representative of seven different kinds of Christians. So I want to ask you something. Are you a legalistic Christian, persecuted Christian, liberal, worldly, are you dead, are you alive, are you apathetic? You know, the best summary of these letters I have ever encountered is the one penned by John Stott in his book, Basic Christianity. He sees the message of Jesus as threefold in nature. To a sinful church, He is saying, "I know of your sin — repent." To a doubtful church He is saying, "I know of your doubt — believe." To a fearful church He is saying, "I know of your fear — endure." Repent, believe and endure — that's a very relevant message for the church today. One final thing about these letters, please note that each of these seven letters end with promises to overcomers. I would exhort you to go through and make a list of them. And you know what? You will find a total of 13 promises. Look for example at Revelation 2:26. It says, "He who overcomes and he who keeps my deeds until the end, to him I will give authority over the nations, and he shall rule them with a rod of iron." That's just one of the 13 promises. His promise is that the redeemed will rule over the nations of the Earth and that of course is speaking about the millennial reign of Jesus Christ. There are 12 other marvelous promises, and all of them are made to overcomers. Are you an overcomer? Are you an heir of these 13 wonderful promises? An overcomer is defined in I John 5:5 as, "He who believes that Jesus is the Son of God. Such a one," John says, "overcomes the world." In the next part on this series on Revelation, we'll get our expert teachers together to discuss Chapters 1-3. 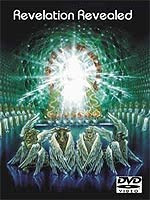 Understand the book of Revelation! Revelation Revealed is a 75-minute survey of the entire book of Revelation and is full of charts, maps, pictures, historical footage and video animations. The first of five video sessions presents an overview of all seven letters which Jesus dictated to churches which were located in Asia Minor, known today as the modern nation of Turkey. The overview focuses on the thirteen promises that the letters make to "overcomers." The subsequent session features the Isle of Patmos, where Jesus appeared to the Apostle John, and the seven churches which Jesus wrote to. Each lesson included emphasizes how the letters apply to the Church today, as well as to individual Christians. i may have asked this before but do the 7 churches really represent 7 stages in church history or is that reading more into the text than intended? how old is that idea? i`m having a hard time proving it represents all church history. Posties say this 'church history' theory proves the pretrib/imminency is wrong because (they say)it concerns a prophecy that has to come to pass before the Rapture can happen. i.e. destroys imminency! To my mind, the church history idea is arrived at by 'hindsight' using an allegorical interpretation and was never originally intended as a literal prophecy for church. There is more to this, but I am too hot to think clearly at present. Please excuse my change of subject. Every so often I listen on line to Simon Jarvis the false shepherd of Robinswood One Church. It is always the same but this time I feel despairing over his use of Isaiah 61:1-4. He uses the Scripture as evidence that God has called him as a prophet in the city of Gloucester. Reading “The Spirit of the Lord is upon me …” then boldly states that ‘ME’, refers to himself. Instead of expounding the truth of Jesus Christ and His ministry; the stinker applies it to his own prophetic work at Robinswood. There is no doubt this church is attracting huge numbers of people, so much so that they are now boasting three Sunday Services. It makes me sick to my stomach that I am to be a part of that filth on 13th June. I have little doubt we will be filmed and that totally disgusts me as it will appear I am approving of it. So far I have said we will sit at the back and I have dared my usually generous husband and mum to not put one penny in the collection. As the day approaches my sense of indignation grows with it. My husband has told me that we do not have to go if I don’t want to. I told him it’s a fact that I don’t want to go there, but at the back of my mind is all your good wisdom urging me on. If I see the camera on me, like as not I will pull a face at it, I won’t be able to help myself. I love my family so much and this is really screwing me up. They are really ‘into’ prayer, and I am certain they think I am going as a result of their prayers. Aaarrggg! Just in case you get a chance to hear it for yourself and reassure me that I am not imagining it, here is the link to Sunday 23rd May. E.I., the Jarvis' sure like to use the words "oneness" and "unity" a lot. It would appear they're focused on the wrong unity. True unity is in Christ forever, and not found in humans abandoning sound doctrine in order to "get along." Remember to keep your eyes on the long term goals - keeping good relations with your family so you can still have their ears when it comes to telling them the truth. They must know you're suffering by visiting their liberal church, and they'll respect you more for it. Just had a thought, E.I. Do ladies wear wide brimmed hats over there in jolly old England like some in our more Southern U.S. churches? Some of those hats have veils, too. You'd be camera protected. Don't know if it'd hide you from the camera or draw more attention, though. I jest (but only in part). It sounds as if you managed to listen to it - I do hope so; at times I feel I must be the one in the wrong! The only way we can be One, is if we each have the mind of Christ. With Jarvis everyone has to agree with him. Hats are a must for weddings in the U.K., but few churches wear them anymore. Pity, I could have made good use of a heavy veil and sunglasses. My young friend has told me I must not spoil the video for the sake of my grandbaby; (I told her I was going to look into the camera, stick my fingers down my throat and retch). I fear my face will look like a bulldog chewing a wasp! I can't help it, truly, what I think always shows on me mush! If you can't find a nice Easter hat & veil you can always check in at yer local mosque and pick up a burka. Yer no confusing me with Gog & Magog are ya now? you wretch! I nigh on swallowed me tongue! I am struggling to titter quietly so as not to wake my hubby. NO Gog, down boy, bad Gog.